Is Amazon Beating Walmart At It's Own Game? 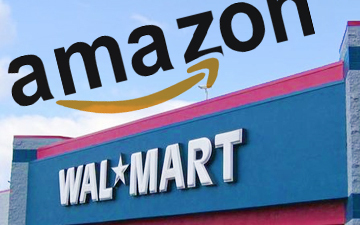 Is Amazon Beating Walmart At It’s Own Game? Walmart has the reputation of everyday low prices. This is because Walmart has built its brand on the fact that you don’t need to wait for a sale to get low prices on everyday products. Just come to Walmart and get low prices everyday. But the problem for Walmart is this – what do you do when your low prices are no longer the lowest prices in the market place? Look at Amazon for example. It’s without question that, item for item, you could go to Amazon.com and find a better price for the same product you’d find Walmart. Couple that with Amazon’s offerings of things like free shipping, and even more discounts when you buy more product, and you now have a pricing environment that even Walmart has a hard time competing with. For example, I went to Walmart.com and took one of the first products I saw which was the HP Mini 210 10.1″ Widescreen Netbook PC. Walmart has then brand new starting at $248.00 and Amazon has them brand new starting at $248.99. The only problem is that at Amazon.com, there are 4 used ones that start at $245.00 and at Walmart.com there are no used ones. I understand that Walmart.com has the lower price on the brand new model, but you tell me which one you’re going to bwaluy? Perhaps you’ll buy only new, and lot’s of people are like that. But a lot of people will take the less expensive model as well, and that’s my whole point. Amazon is beating Walmart at its own game by offering even lower prices on items that you can find at Walmart. And when that happens, the bottom line is that Amazon starts turning over more products, faster. So Walmart might have the everyday low prices you’d expect, but it’s looking more and more like Amazon.com has everyday lower prices than anyone else in the market place.